How can a library be reconstructed when no visual record and little documentation of it exists? 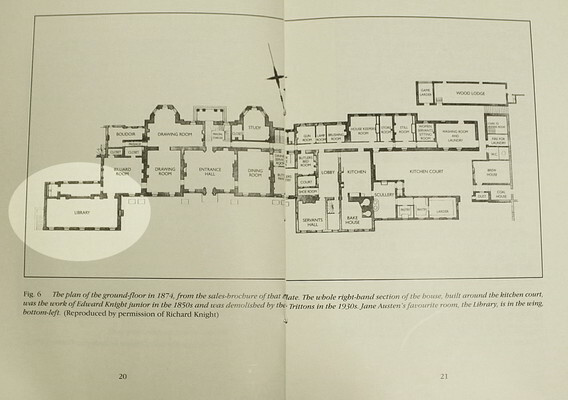 Our reimagining is based on partial descriptions of the library, floor plans and photographs of other rooms in Godmersham Park, and more general research into contemporary architecture, country house libraries, and the history of the Knight family. In 1920, Henry Avray Tipping described Godmersham Park in detail and included several photos in his article “Country Homes, Gardens Old and New: Godmersham Park, Kent, the Property of Lord Masham.” He mentions the “great bookcases” of “the same period  and in the style” of the “rusticated gate-posts…topped with caps and urns in the manner of Robert Adam.” These shelves, according to Tipping, are “about 15 ft. wide, those at either end of the room being straight fronted, but that occupying the middle position between the chimneypieces has a deep centre and diminishing sides, a form that greatly enhances the effect in its position between the slightly projecting chimney-breasts”. Unfortunately, no photographs accompany this description. Christopher Hussey, in his 1945 Country Life article on Godmersham Park, noted that the entrance hall and drawing room were “fully decorated” and “thoroughly representative of the taste of the 1730s.” The “simplicity of the remainder” of the rest of the house–including the library–was, Hussey suspects, due to a lack of resources after Thomas Knight senior’s spending on the entrance hall and dining room. In the absence of definitive information, our artistic rendering of the Godmersham Park Library takes creative license, while trying to be as historically accurate as possible given the resources available. We began with the overall architecture of Robert Adam’s neoclassical style, drawing elements from the primary rooms of the house to use in the library. Our artist incorporated elements from the fireplace and door lintels in the entrance hall and drawing room, and consulted paintings and photographs of other historical country house libraries to find models of period-appropriate furnishings. The globe in our recreated library (bottom right) is based on this one (bottom left), by the popular late eighteenth-century London artisan William Barden and his son Thomas. The most important aspect of our library recreation, however, was the construction of the bookshelves. Because we knew the order and general size of the books, we wanted to replicate the shelves to scale in order to give the best sense of how they would have looked to Austen when she visited. The only information we had to work with was the general size of each case – “about 15 feet wide,” according to Tipping in Country Life—and data we could infer from the Godmersham catalogue itself. First, we counted the number of volumes that the catalogue listed on each shelf. Multi-volume sets are identified after their title; otherwise each book is a single volume. Then, we allotted each volume a width of one inch—a rough average to account for volumes both fat and thin. This allowed us to arrive at an estimate of the width of each shelf. So this section of the shelf—with 2 single-volume titles, one three-volume title, and one twenty-five volume title—measures 30 inches across. The catalogue also lists the size of each volume, so by deciding on an average height for each format—folio volumes are 20 inches, quartos are 12 inches, etc—we inferred the minimum height of each shelf. In this example, the tallest volume on the shelf is an octavo, so we have made the shelf 12 inches tall. These somewhat arbitrary measurements are useful for their relative difference, revealing that some shelves would necessarily be much taller or wider than others. Some mysteries remained, however, such as what was meant by the “slips,” which were listed in the catalogue either before or after the columns of each case—or, in the case of the first slip of the south case, at the very end of the catalogue. The usage in the catalogue seemed to imply that slips are similar to shelf columns, but we could never determine with certainty what they were. In the end, based on photos of other library shelves of the period, we decided to treat slips as narrower columns. To provide consistency across the slips in all three bookcases, we placed them on either side of the central column. In the catalogue, the books listed in the slips were always smaller sizes, so we imagined their shelves would generally be shorter as well. Finally, to avoid the visual awkwardness of a gaping hole at the top of each slip, we assigned empty shelves instead. After collecting a series of descriptions and reference images and calculating the size of our imagined shelves, we turned to an artist and web developer to create the aesthetic and technical elements of the project. To present the books in our digital library, a team of research assistants, volunteers, librarians, and archivists gathered, sorted, and cropped thousands of photos of the spines, title pages, book plates, and sometimes even marginalia of the extant books (see the catalogue, bookplates, and GLOSS section for more). On Reading with Austen, these extant books are represented on the shelves by their spines. Missing volumes are represented by a generic spine image. Where possible, we include links to digital editions available on open-access websites such as Google Books, Archive.org, and HathiTrust, or subscription services like Early English Books Online. Our data is derived from a spreadsheet, created by Deborah Bygrave and revised by Hugh Mackay under the direction of Stephen Bending and Stephen Bygrave, which included transcriptions of the catalogue speculation about matching volumes, and other notes such as location at Chawton House. Building extensively on the original spreadsheet, we added obliterated entries, corrected transcription errors, and assigned an identification number to each entry based on its shelf location. If an entry was obliterated and entered again later in the physical catalogue, we included only the later entry (with its shelf location) in our data. If an entry was obliterated, without any repetitions, then we included that obliterated entry. We modified the base transcription in other ways, as well. We filled in “Ditto” and “…” to match the entry above. Some entries, especially European works, did not have a place or date of publication; after matching the entry to a published work, we included that metadata in square brackets. We then matched these catalogue entries to photographs taken of works identified as part of the library, a process complicated by various elements of eighteenth-century printing, such as multiple title pages and unnumbered and/or undated editions. Once we established which catalogue entry matched each physical work (sometimes a single volume, sometimes a set), we transcribed the title page’s metadata, collecting information about the title, author, and publication, and noting any significant marginalia such as Edward Austen Knight’s signatures. Although we transcribed French characters, we removed macrons. Because less than half of the books are extant, we had several hundred entries identified by a few words derived from the spine of the work, along with place and date of publication. Some descriptions were very specific, such as “Weld’s Travels in America 2 vols London 1800,” while others, such as “Miscellanies London 1788,” were significantly more vague. For these works, we found the closest match possible, relying on resources such as the English Short Title Catalogue and the Copac catalogue. For all of our entries, we also tried to find links to online editions. We prioritized publicly available resources such as Google Books, Archive.org, and HathiTrust, but if we could not find an item available freely online, we turned to resources such as Early English Books Online and Eighteenth Century Collections Online. Again, we aimed for the closest possible match for each work. For some books, we could not find online versions at all. We are currently working on a clean dataset that will be released under a Creative Commons licence, useful for anyone with more questions about the collection: what were the most common words in the book titles? When were most of the books published? Is the collection dominated by a certain genre, or author, or publishing house? We hope that this website and its data will be of interest not only to lovers of Jane Austen, but also to bibliophiles, antiquarians, and anyone engaged with print culture and digital humanities.